MRI wheelchair accessories, I.V. 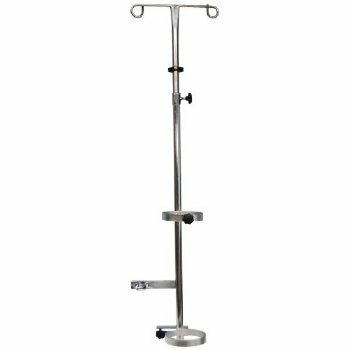 and Oxygen Tank Holder for MRI wheelchairs, Non-Magnetic for use in the MR suite. For use with our complete line of MRI chairs, NOT for use on our Non-Ferromagnetic Wheelchairs. Made with non-magnetic stainless steel for durability and strength. Quick and simple installation, simply remove kick tube cap and slide the I.V. Oxygen Pole over the kick tube and tighten knob. Use U bolt to fasten to frame of the chair. Designed with two hooks to hang I.V. bags from. This adjustable height MRI wheelchair I.V. Pole can be adjusted up or down. Can be used on our complete line of MRI Wheelchairs. These I.V. oxygen poles are NOT for use on our Non-Ferromagnetic line of wheelchairs. This non-magnetic MRI I.V. Oxygen Pole is constructed entirely of non-ferrous materials. 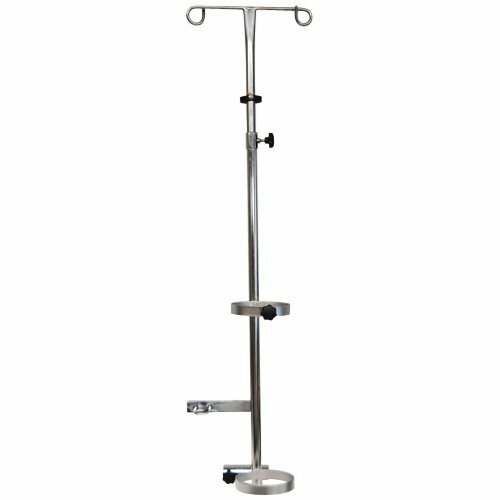 It is specifically suited for use in MRI rooms. All materials including fasteners are either non-ferrous materials or special polymers.